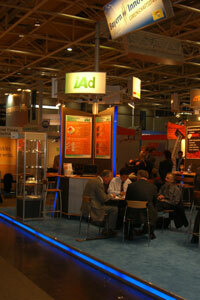 iAd participated at the Hannover Fair 2006 within the joint booth of "Bayern Innovativ". New contacts were extablished while present ones were refreshed. 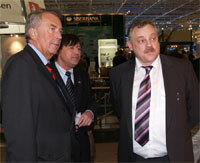 The booth of iAd was visited by the bavarian secretary of state Mr. Hans Spitzner (left). During this visit, Mr. Hermann Hampel (right), CEO of iAd, was pleased to present the company and its products.